I have a deep love for data. It has an incredible ability to unmask the hidden truths of reality. So many discoveries come from the observations recorded in data and shared with the world. Consider its power to advance public health, as it happened with the world’s first epidemiological analysis in 1854. Then there’s the commercial value, of course. Tech giants aren’t the only ones to recognize this but they’re the easiest to point out given the potential monopoly effects, as written by The Economist. So yes, I love data for many good reasons. But it’s important to keep data in the friend zone. Otherwise, it creates some really deranged behavior. After all, what makes a good public school? Is it the test scores? Really? The crushing pressure to meet academic test standards wrenches the life out of learning. Not because data-driven education is a failure. No, it is a debilitating success. At scale, test scores are a reliable signal of student ability. These scores contribute to a systematic approach. But as the teachers in Atlanta showed, it’s a system that can easily be gamed. And even when the scores come about honestly, the kids still aren’t necessarily engaged. All the same, we shouldn’t throw out test scores. We shouldn’t stop offering standardized tests. We should just keep that data in the friend zone. It’s useful. It’s appreciated. And at scale, these test scores help us do that thing that every manager loves to do: control performance. Regardless of your job title, you are a manager. Because there is some aspect of your life that you wish to improve. There is also more data to help you than ever before. Consider our efforts for weight loss. Correlate these efforts with the explosive growth of the wearable industry and you find that everyone not only wants to lose weight and be healthy but they also want the data to show them how. Why? Again, to control performance. For many people, these wearables become deeply influential. The data defines the quality of their lived experience. Was it a good day? Am I becoming the best version of myself? Let’s consult the Fitbit and see. This is a completely healthy idea if you have the right goal in mind. The data then follows as a reinforcement mechanism. It helps you define and then, again, control performance. Just remember that we cannot easily measure what matters. We often make what we can measure matter instead. This is how the 10,000 step goal became ubiquitous. Millions of people have this as their daily goal. Why? How did we become so enamored with the 10k? There are two reasons. First, it is a nice round number that lends itself to cognitive ease (that phenomenon that makes us also think a chicken’s body temperature is 144 degrees). This nice round number informed the Japanese marketing campaign that introduced the whole concept in the 1960’s. See the history on manpo-kei for more. Second, the 10k step goal is born from the limits of instrumentation. Wearables originally began with the pedometer. This technology goes as far back as the 1700s. But sooner still, the classic digital pedometer launched in 1985 and became the best method for enthusiasts to manage and control their physical performance. As devices go, there simply wasn’t anything else that was easily available for mass production. Heart rate monitors couldn’t be affordably minitiatorized. So pedometers it was. If necessity is the mother of invention, constraint is the step-father. Fitbits soon followed. Along with Nike/Apple cross-brand devices. These originally clipped to your garments. Then they went around your wrist. Regardless, the mass adoption and the easy programmable tracking of 10,000 steps led to its growth as a ubiquitous idea. Which, to be clear, is lovely. It just isn’t the most effective means of achieving the “fit” part of the “fitbit”. If you want fitness, and subsequent weight loss, try three 10-minute sessions of vigorous activity. Because step counts aren’t the best measure. Heart rate is. That’s what matters. And now that heart rate monitors are relatively affordable, we can shift our focus. Until some better metric comes along. The point, of course, is that we made what we could measure more important than that which actually mattered more. Which is something every manager does from time to time. So we’re all managers. Congratulations. We’re all people, too. We can’t discount the power of a compelling idea and a device to helps to sell it. In an alternate universe, if someone would have created an affordable breathing monitor and someone else had conjured a public health campaign around healthy people taking 30,000 breaths a day, I think we could have seen the same result. Breathe your way to 30k! To quote Kurt Vonnegut, So it goes. It is true enough that not every conceivable complex human situation can be fully reduced to the lines on a graph, or to percentage points on a chart, or to figures on a balance sheet. But all reality can be reasoned about. And not to quantify what can be quantified is only to be content with something less than the full range of reason. This is true. McNamara is right. But this idea must be curtailed because it is an invasive vine that spreads over the garden and chokes out everything. And like a vine, it doesn’t spread overnight. And it doesn’t happen without success. There is a certain bureaucratic momentum that takes over once the first body count report shows a real marker of success. The hyper-rational systems of data-driven management hinges on explore/exploit. You explore all methods until one shows signs of success. Then the exploitation mode kicks into hyperdrive and you get, well, the stuff that happened during Vietnam. 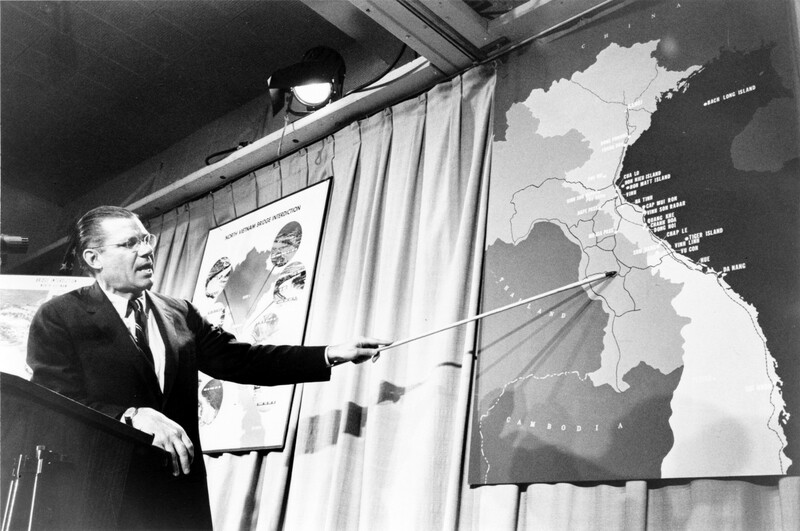 Stuff that wartime generals would later call “blatant lies.” With numbers that were “grossly exaggerated by many units primarily because of the incredible interest shown by people like McNamara.” Again, see the MIT article for more. It’s just like the teachers changing the answers on a standardized test. In an imperfectly knowable world, there is a latent irrationality in all metrics. For any given metric, there will always arise instances when maximizing the metric is at odds with advancing the goals that metric was designed to service. Consider the irony that a war in Vietnam, which was launched to restore peace, defined its success on body count. I don’t think it is a stretch to say that McNamara’s logic centered on the idea that increasing the body count would restore the peace. The metric (violent death) is truly at odds with the goal (peace). And teachers changing test answers? That, and the underlying metric, is truly at odds with the goal of educating children. But it is these same data-driven methods that I’ve championed in two favorite books on management and a book on organizational development. Those books include Andy Grove’s High Output Management, Ben Horowitz’s The Hard Thing About Hard Things, and Laszlo Bock’s Work Rules! I consider Grove and Horowitz’s books to be two of my Top Three best books ever written on management. The book reviews are here and here. I consider Bock’s book to be the best in organizational development. The book review is here. I stand by those. But only because I have Matthew Stewart’s masterpiece to keep me balanced. Steward wrote his book, The Management Myth, in 2009 and it immediately became a challenge to all the dominant thinking that continues to this day. Rightfully so. The confusion of facts and values (or rather, the attempt to find pseudotechnical solutions to moral and political problems) is the most cardinal sin of management theory today. We get a cardinal sin. Should we measure? Yes. Even when done imperfectly, it’s crucial to have for the reasons McNamara himself said. Just remember: it is always done imperfectly. And the commensurate reasoning that it provides, as important as it is, cannot replace the values we hold dear. Love your data. Get all the data you can. But keep it in the friend zone. Keep it at a distance.